1) I recently installed the desktop plugin on a new computer and it's no longer syncing with that person's calendar. 2) When we add users, are we able to have events scheduled under those users to ONLY appear on their calendar by using a second installation of the Outlook desktop plugin? Or is there only 1 plugin allowed to sync with 1 calendar for our entirr account...? The plug-in connects your Calendly account to your Outlook calendar. It runs locally in the background on the computer you download it to. Your device and the plug-in will need to be running for new events to appear in your Outlook calendar. Any changes made while your computer is off and the plug-in is disconnected will update once your machine is back on. The Calendly for Outlook plug-in does have a setting option for it to sync in real time while your computer is running and connected to the internet. 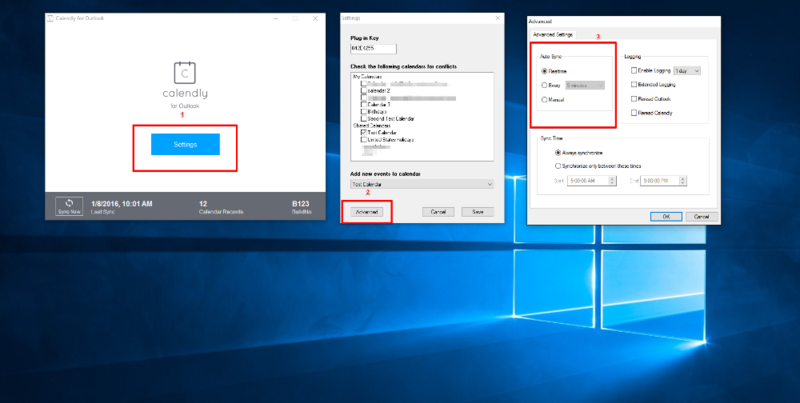 With your plug-in open, you can click "sync now" to initiate a connection with your Outlook calendar. You will also be able to make sure your events are syncing in real time by clicking Settings > Advanced > Auto Sync "Realtime" > OK . You can also adjust your settings so that your plug-in runs on startup for your computer by following the steps here: Adding Programs to Startup. For new computers, please make sure that the plug-in key is up-to-date and connected to the correct calendar. I might suggest forcing a sync by clicking "sync now".